One of the most powerful features introduced in CRM 2013 is Actions. It strongly supports the concept of XRM platform. Actions are the Custom messages which can be created for any entity or globally to perform business operations like create/update/Assign etc. (more than what a Workflow can do). Looking first time we get a feeling that it is very similar to Workflow but hold on it’s very different from WF’s or Plugins. Can be associated with single entity or globally. Actions support Arguments – Input and Output Arguments. Supports Rollback and executes in real time. Always runs under the context of the calling user. These are the parameters which need to be passed during action call. These can be Optional/Mandatory. For Mandatory argument it is necessary to provide some value while calling this action. These input arguments can be used as variables while performing any operation in the action. These are the parameters which can be returned when the action is called. These can be Optional/Mandatory. To understand in an easy way we can compare actions with a Function/method in normal C# programming which can have parameters and also can return something at the end. Let’s take a look of the different types of Arguments it supports. To create this we need to navigate to Processes and select Category as Actions. In primary entity I am selecting Enquiry which is custom entity in my case. I have taken one Input Parameter- ProjectName. And in the step I am using this Variable during creating a Project’s record which is again a custom entity. And here is the snap of the Step which I have configured. Here we can see that I am using this ProjectName as a dynamic value during the Project Creation. Here note that new_EnquiryCreateProject is the name of the Action which should be referred while calling this through API. Now we can call this Action from our Plugin. I have a Plugin which fires on Post Create of Enquiry. There I am calling this Action. I am passing the Input Argument ProjectName as Parameter before calling this Action. Once this is called It creates a new Project record. And now the most Amazing part of Actions are that we can consider this as a unique message and can register this through Plugin registration tool and can do Custom Validations if we want to do during the execution time. Let’s say during the execution of this Action I want to validate something or abort this Operation in certain conditions then we can easily do by registering this as a message which is a great example of Xrm support in CRM 2013 as now it is not restricted to messages like Create, update, delete etc. Below it is shown how we can register this through Plugin Registration Tool. Note: These actions are little bit different from Plugins as return type of the Target is not Entity but it is Entity Reference. During the execution of this Action we can get the Input Arguments and use this for any type of validations. Below is the sample where I am reading the values of the Target and the Input Argument ProjectName used in the above example. Here we can clearly see that the context contains only 2 values one is the Parameter and the other one is the Target. As a developer, introduction to Actions in this CRM 2013 release is really a great improvement from CRM’s perspective which will help us to minimize the coding part and also achieve some complex requirement easily. 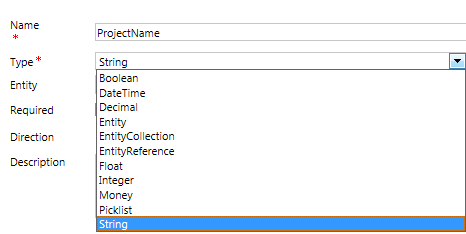 This entry was posted on October 23, 2013, 2:06 pm and is filed under CRM 2013, Customizations. You can follow any responses to this entry through RSS 2.0. You can leave a response, or trackback from your own site. thank you for your post. This was the most helpful post on actions I could find. I’ve created an Action, tried to trigger it from JS using SOAP call. Its not getting triggered. I’ve called it from custom code, its works fine. With SOAP call, the request gets succeeded with response statuscode =200 , but no impact on Action. Could you pls help out? How to create custom message for action? Can you pls assist ? Also, FYI – I came across your post from this link. I thought it would be nice to let you know that your work has gotten recognition. Thanks. Thanks for this Deepak, yours was the only blog post that mentioned this: “Target is not Entity but it is Entity Reference”. Not knowing this was causing me all sorts of headaches and I couldn’t figure out why my plugin wasn’t firing. Now all sorted! Excellent, thanks for the info, very helpful.